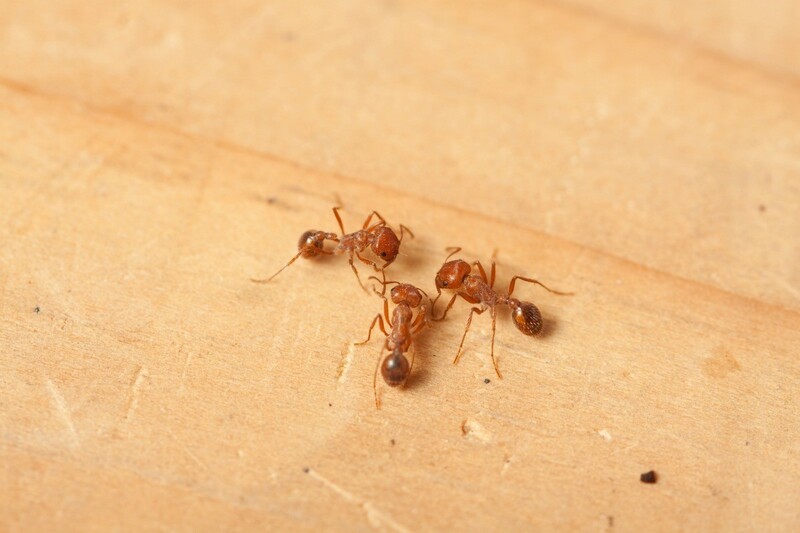 Fire ants are not only annoying when they invade your home or yard, but their bite is also very painful to humans and their pets. This is a guide about getting rid of fire ants. To kill those pesky fire ants use coffee grounds. Don't throw away those used coffee grounds after you perk that pot. Place in a plastic bag and save them. When you find a hill of ants in your yard place them on top and around the hill. Within a few hours the hill will be filled with dead ants. Take the grounds on camping trips or other family outings. You never know when you may need them. This really works, I have seen it with my own eyes. We are having a terrible time with fire ants this year. I don't want to use anything harmful to children or pets. Does anyone have any good way to get rid of them? I have found if I pour uncooked grits on and around the mound. The ants will bring the grits down into their hole to eat and it will cause their stomaches to explode. I just posted this to the HappyGarden List just last week. I think you will find it to be of use to you. It was printed in Organic Gardening Magazine, so no need to worry about it being safe, it is safe. I recommended it to one of my friends on the list, as I know how bad fireants are in Florida from first-hand experience. Linne did not think that the DE would be washed away, but said she would place a piepan or something like that over it to help keep the DE in place. Last summer we had dozens of ant hills in our gravels driveway, lawn, and gardens. Then I began finding ants in the house! I used diatomaceous earth (DE), which kills by scratching and drying out the insects rather than poisoning them. In a few weeks, almost all of the ants were gone. I had no worries about using the non-toxic DE, which is the fossilized remains of tiny plants called diatoms. This sounds like an excelent idea. I would think this would be wonderful to control fireants in your neck of the woods, Linne. I know how bad they get down there in Florida. I do think that you may have to reapply after a hard or heavy rain. Editor's Note: We called the poison control center about Borax. They said it is generally safe to use unless children or pets eat a lot of it. I use to work at a daycare, and the health inspectors would not allow insecticides because of the children. The administrator was told to use cornmeal, supposedly they ingest it and can't digest it and it kills them safely. I know it works for regular ants, I am sure it would work for fire ants also. To kill fire ants, boil a pot of water and pour it on your garden bed. The water will kills them instantly and they will not return. The bigger the pot the better. This way will be the most hazardous way to kill fire ants too. Trying to get 8 pounds or more of boiling water to the ant bed while it is still hot enough to kill the ants and not splashing it onto your arm or slipping and spilling the contents on yourself. The other thing it will do, which is not good for the garden, is to sterilize the ground / soil where it is poor along with killing any vegetation it splashes on. I would like to know a good way to get rid of fire ants. I noticed a couple fire ants beds in a flower bed. I sprinkled corn meal on them. After several days I didn't see any ants but when I dug down in the ground they were running around. It seems to contain them for some reason. As long as they don't come to the surface I don't care if they are there. I know, this is strange. I used uncooked grits when I lived in AL, FL, and GA from 1982-2010 (I live in the UK now). I sprinkled a good handful atop the mound, repeated if it rained. It didn't really kill so much as drive the swarm out of my yard-they'd move the mound ten or 15 feet away, I'd sprinkle more uncooked grits; they'd move, I'd sprinkle...until they moved right out of the entire half acre of lawn and garden. Another thing you can do is contact your local co-operative extension office or find their webpages online. The online pages will have lots of information on how to handle fire ants in your specific area. I have 7 ant hills in my back garden. It started off at 5 a few weeks ago. I dug 3 up, but more came in a few days. I tried Ant Attack, but still the ants are there. I tried ant powder and now I am trying salt. Any ideas anyone? You can use the drench method of a liquid insecticide poured into the mound; make sure that the whole mound is treated. Pour enough volume of the liquid insecticide into the mound to kill the queens. I need to get rid of fire ants in my yard. I have tried everything, but nothing helps. Can someone tell me what to do? I never knew what a fire ant hill looked like until a few years ago and they started showing up here and there in our county. When we found a hill in our back yard, I went to Ace Hardware or Southern States Feed store and purchased a container of Amdro. I think it was around $18.00, not cheap but well worth the price. You just sprinkle 2-3 tablespoons on the hill and they take it into the nest and it kills them. I treated the hill in our back yard about a dozen more hills in the areas where we walk and pick up litter. It quickly solved the problem with fire ants in those areas. I am looking for an all natural way to kill fire ants. We have animals, we have chickens (they help, but not in the garden during growing season), and we have kids. We try to do as much natural remedies as we can. If someone has a recipe to share, I thank you in advance. How can I keep fire ants out of my dog's food bowls? I've tried chalk, orange peels, and even Vaseline coated bowls. These fierce southern fire ants have proven hard to detour! Keep the bowls in a tray of water. The ants can't cross water and survive. Sprinkle powdered Cinnamon around bowls. Have you tried food grade diatomaceous earth? I'd put it on the ants and follow them to where they come from. You could put a barrier all around your dog's pen or your yard if you have to. It will let the ants in, but will kill them. It's taken care of bugs by the second day for me. It won't hurt your dog, you, or children if they get into it either. If you have a bad problem, spread it around your yard and all around the outside of your house too. It's safe to use indoors, but it is a dust, so it can be messy if you're not careful. Just make sure it's food grade. Some sites say it is dangerous if breathed in, but that's the non-food grade, which is poisonous if ingested, so just stay away from that type. I live in Texas and I have fire ants around my Meyers lemon tree. I need a natural recipe to get rid of them. If you discover a natural fire ant killer, you can make your fortune! We buy an insecticide, but they still spread. Evil little critters. My mother has a severe problem with fire ants. Lots of things have been tried, but they just seem to move. They are everywhere on her property from trees, to grass, to shrubs, and they are starting to get in my niece's sandbox. Any help would be great. Corn meal. It's cheap and kills the whole family including the queen. It's safe for animals and kids. They can't digest it and they die. It takes a couple of weeks but soon you will see a lot fewer ants. Is there anything that will get rid of for good fire ants in SC? I am thinking of Decon, the rat poison. There is a product made by Bengal. It's a white powder that will zap a mound quicker than you can imagine! 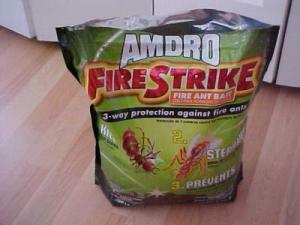 We used to use the Amdro Ant Bait but it took a few days to work. My DH brought this product home and it works like a charm. We have two dogs in the yard, we keep a close eye on the it when we use it! I am looking for a chemical to use to control fire ants. Can anyone tell me what we can use? There are a lot of different remedies out there for getting rid of fire ants. The link is to a web page that is all about fire ants and how to control them. If you don't want to use chemicals, you can do a search here at ThriftyFun. Lots of folks have given some good tips on controlling fire ants. Ah yes, those pesky fire ants. I have just spent the last 3 days getting rid of an entire nest of them in my back yard. I tried everything in the past and the "only" one that works is AMDRO Fire Strike and my neighbors, who also garden, agree. You "must" follow the instructions, such as do not disturb the nest before putting the AMDRO on, just sprinkle it all around the nest after the dew dries on the ground in the morning. Has any one got a tried and true natural way to get rid of fire ants? I have chickens, dogs and so forth. Also a grand baby that visits from time to time.